So DIY envelopes are my new thing! A friend bought me an awesome craft book for Christmas that had ready-made greeting cards inside it (see below for shopping link). But the problem was that the greeting cards didn’t fit standard sized envelopes. Last Sunday I was meeting a friend for lunch and planned to give her one of these cards, but without an envelope the card would look a bit out of place. 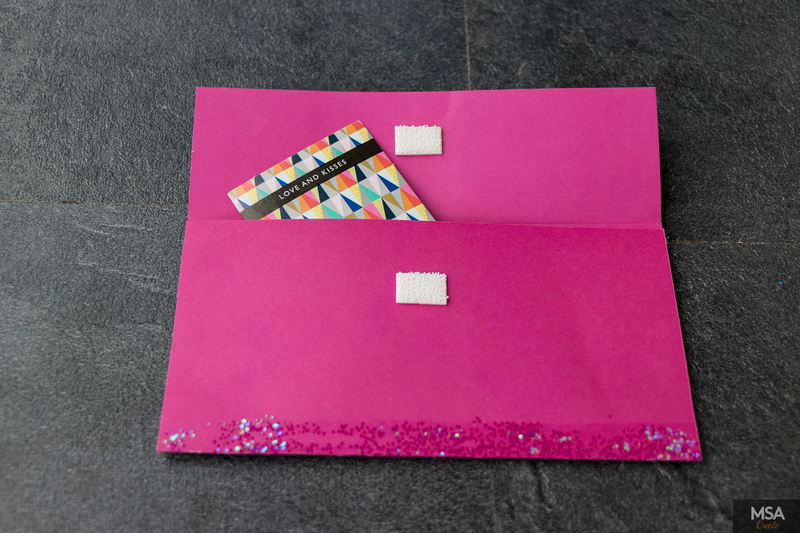 Then my own words came back again to prompt me to action, “Create what you can’t find.” I suddenly realised that I could make my own envelope with some paper, a glue gun and embellishments. Yayyy!! Within minutes I had crafted a bespoke envelope that I was insanely proud of. Truly, lack is the seedbed for creativity! 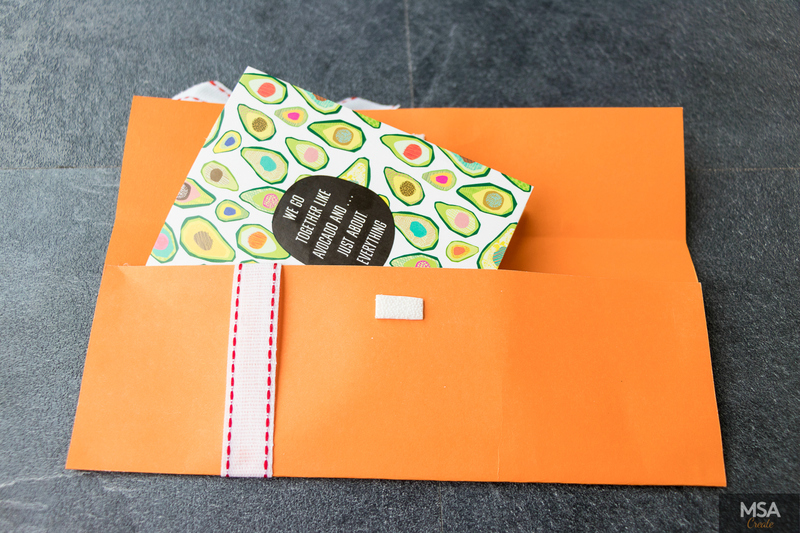 This envelope features a frog fastener which acts to keep the envelope closed. I had bought some frog fasteners ages ago for a cape that I planned to sew, but they had sat in my sewing box waiting for the perfect opportunity to be used. 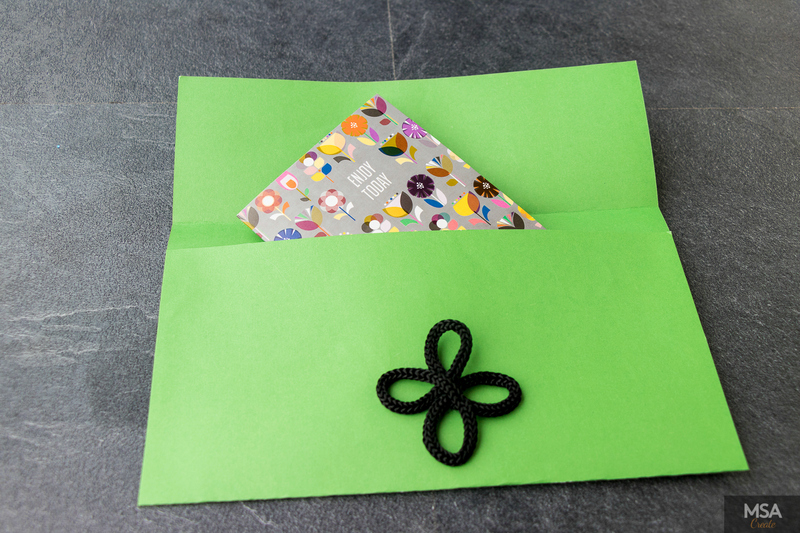 The fastener gives an Asian feel to this envelope which I just love! The overall finish is very sophisticated and almost regal. 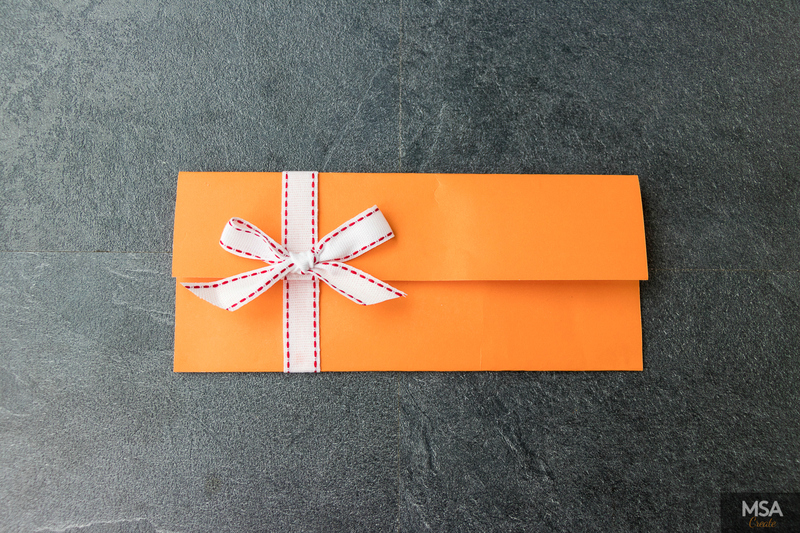 Cut a piece of stiff paper to fit the dimensions of your card or whatever item you choose to put inside the envelope; leave at least a 1 cm margin on either side. 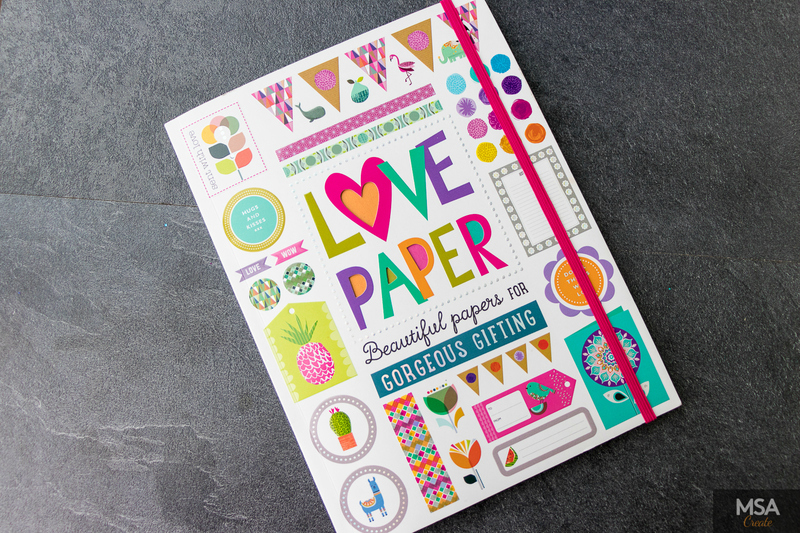 The length of the paper should be 2 & 1/2 times the width of your card/item. Fold the bottom two thirds of the paper upwards (N.B. it should be the width or the shorter edge that you fold upwards). Then using the red dots as a guide, glue the sides of the paper together with a glue gun or double sided tape to form a pocket. 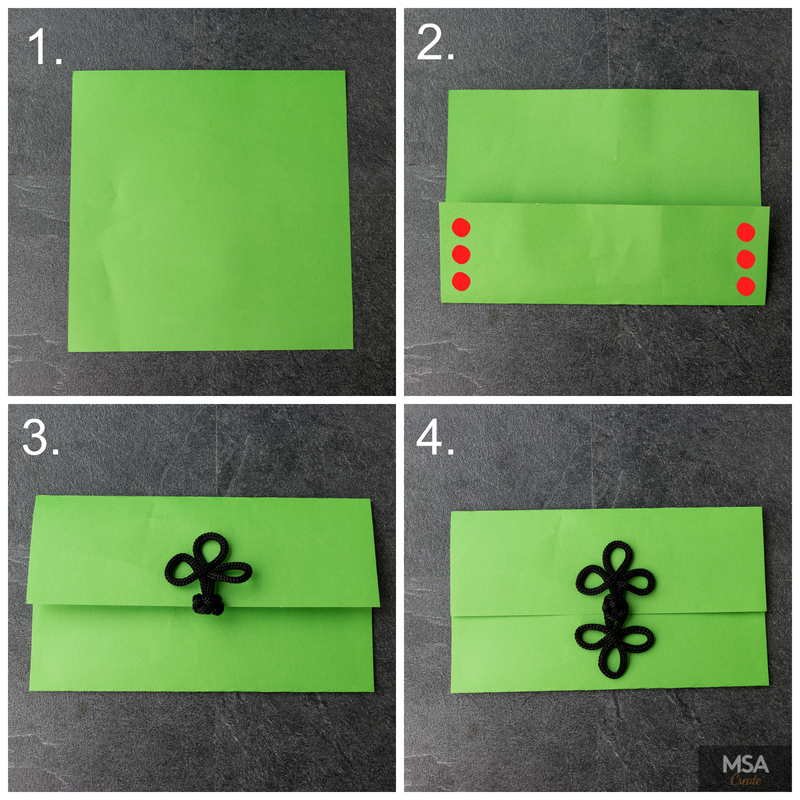 Fold the top section of the paper downwards to create the envelope and stick one half of the frog fastener onto it, making sure it’s centred. Then fasten the frog fastener with its other half before sticking down this half to the bottom section of the envelope. I imagine using this envelope for a feminine or flirty occasion. It’s so very cutesy! 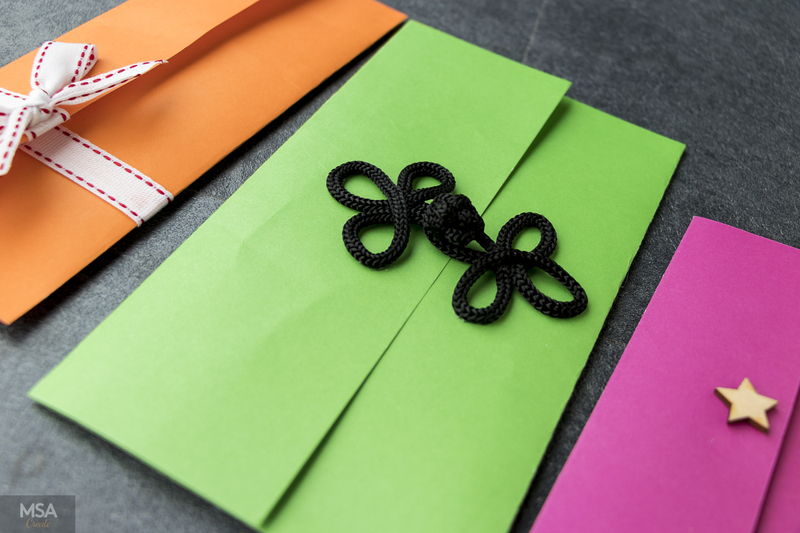 I just used simple ribbon to create a focal point on this envelope and it’s quite effective. Since the ribbon is just used for decoration, I had to find a way to keep this envelope closed. I remembered that I had some Command picture hanging strips at home, so I just cut them into small sections and used them as my ‘clasp’ – they worked brilliantly! 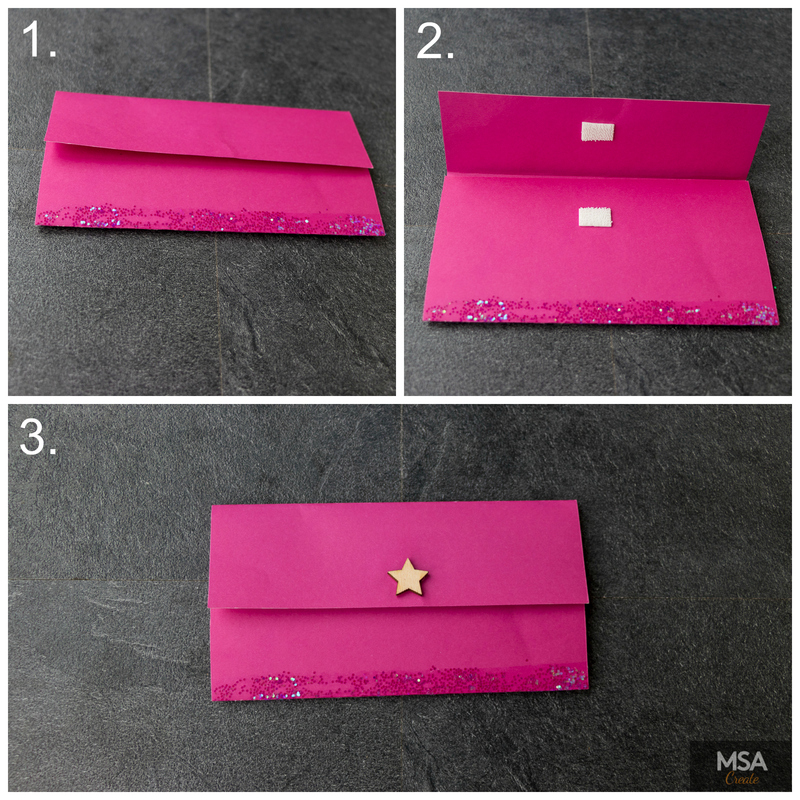 Follow steps 1-3 from the ‘SophistiKat’ envelope above to make your envelope. 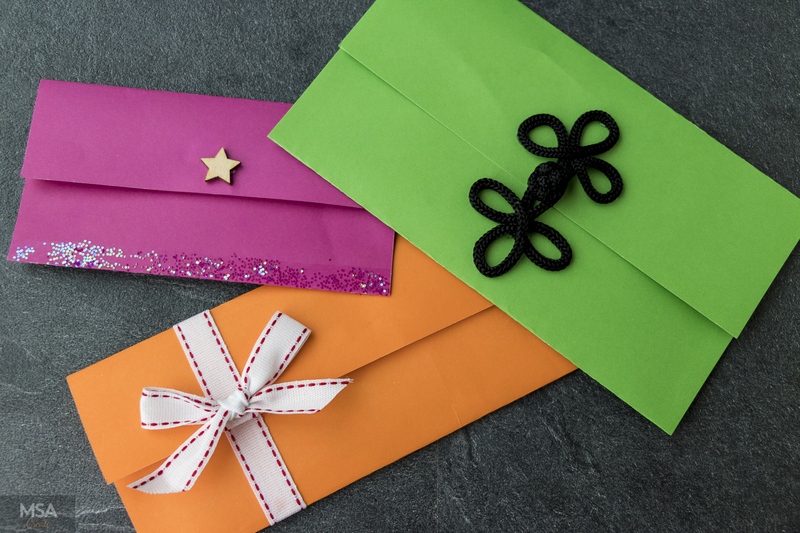 Cut a length of ribbon that is long enough to cover the back and front flaps of the envelope with an overhang which will be tucked under the flaps. 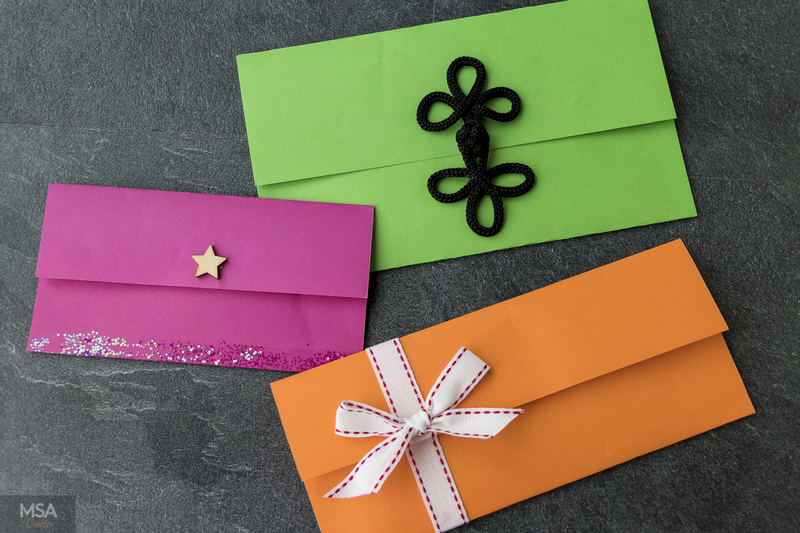 Glue the ribbon to the envelope and make sure you tuck the ends into the envelope and under the top flap for a neat finish. 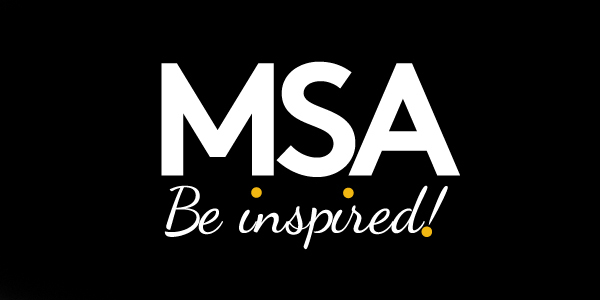 I chose to place my ribbon to the left hand side for some visual interest, but feel free to place it wherever you want. Cut another length of ribbon and tie a bow with it. 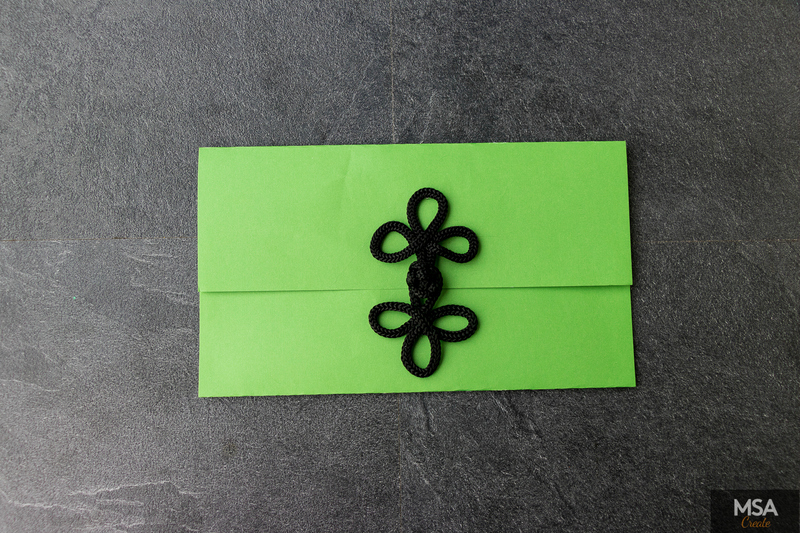 Then stick this bow onto the ribbon on the top flap to complete the envelope. Miss Glitter Sparkles has to be the funnest envelope by far. I mean, what a great excuse to use glitter! I will warn you though, no matter how tidy you may be glitter just has a way of getting everywhere!! I even got some on my camera and I have no idea how it happened. So be prepared for a bit of mess, but it’s just so worth it when I look at this card – I just can’t be mad. I think this sort of envelope is purrfect for Hen Do invites. What do you think? 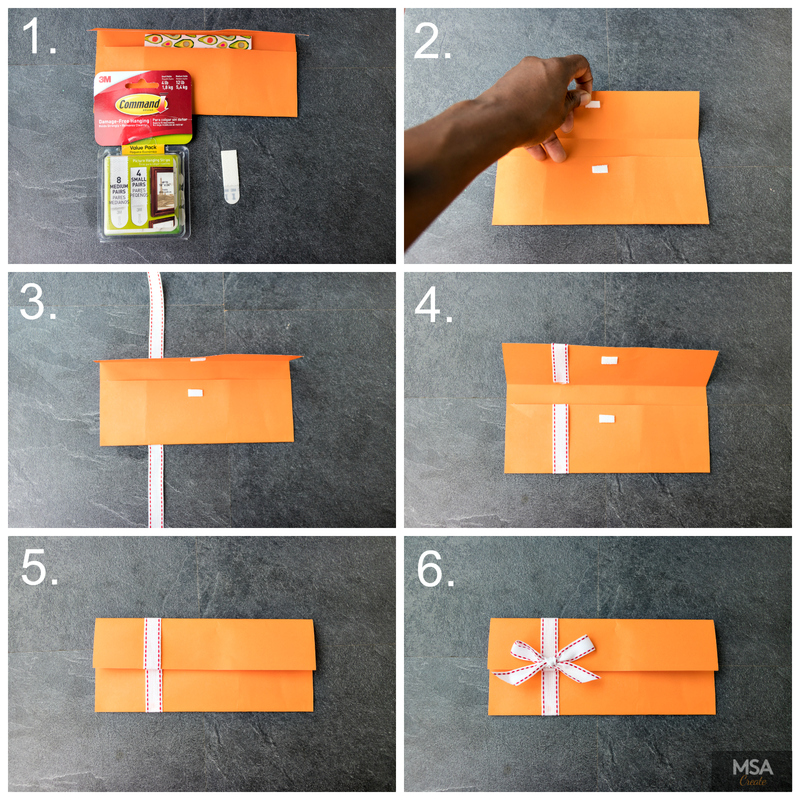 Follow steps 1-3 from the ‘SophistiKat’ envelope above to make your envelope. 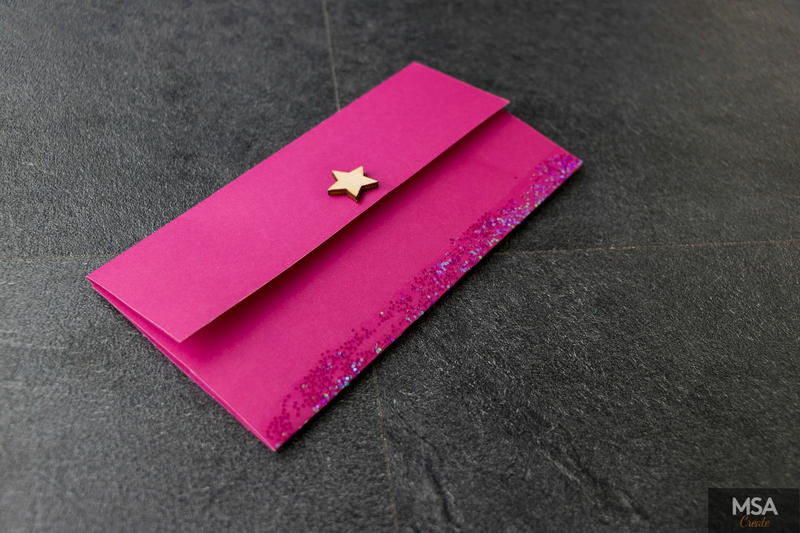 then use a glue stick to spread a 1 cm thick line of glue along the bottom of the envelope and pour or tick the glitter onto it. 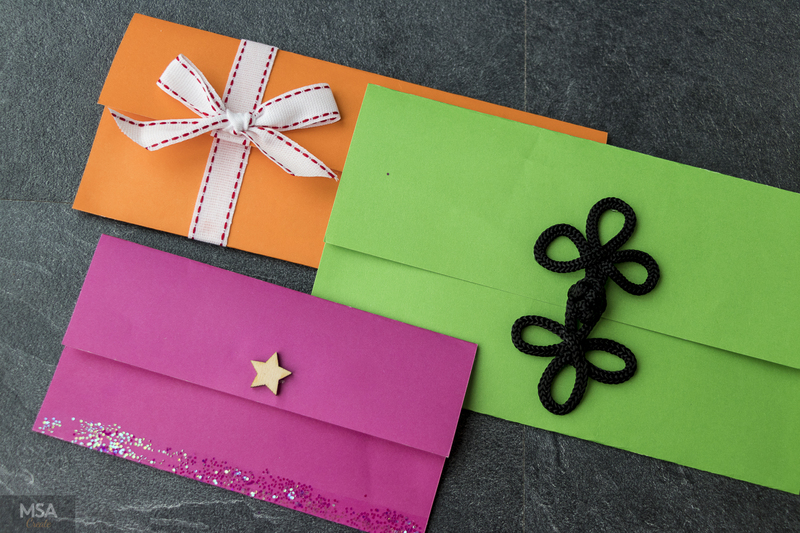 Stick a wooden star onto the centre of the top flap and your envelope is complete!